3 Kits For A Great Price! Happy Tuesday Bella Gypsy Fans! Kiana back to bring you this weeks great deals at Gotta Pixel! Bella Gypsy has THREE kits in the sale bins over at GP today!!! In the $1 deals you can get this fun kit! There are TWO great kits in the $2 bin! These are great deals for these fabulous kits! Run over and grab these deals while you can! Good Evening Bella Gypsy Fans! Kiana here! Usually bring you these goodies in the mornings but I have no idea where my day went today! We spent a good portion of the day enjoying the spring weather we are having here so that might be why the day got away from me! We are expecting rain tomorrow so there will be plenty of time to scrap then! 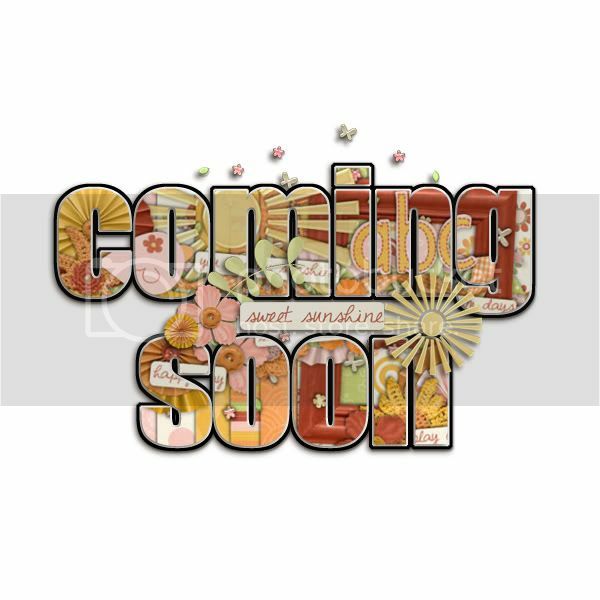 If spring showers are coming your way, and you are looking for some new goodies to scrap with there are two of my favorite Bella Gyspy kits in the $2 bin at Gotta Pixel today! First up is Heavy Equipment. A perfect kit for anyone with rugged, tough boys in the house! And second we have “A Case of the Ickies” the kit for you if you have pics of those sad little sick faces. My son just had to have surgery and I have some post op pics I think I am going to scrap using this kit. Gotta document all the memories good and bad right? Happy Friday Scrappers! It’s Kim here bringing you the scoop for today and a little freebie I whipped up just for you! This is going to be short and sweet today! There are not any new releases today….but I wanted to give you a freebie QP made with Grins and Giggles! Here’s this adorable and fun kit…just in case you missed it earlier in the month when it was released! Be sure to check out the coordinating Word Art and Stacked Papers too! …and here’s a QP just for you! Hello, hello and Good Morning! 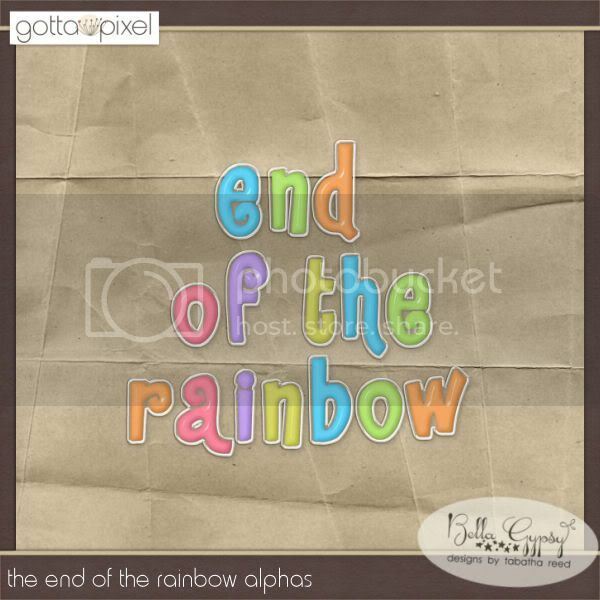 Kiana here bringing you this yummy treat from Bella Gypsy that is in the $2 pixel bin at Gotta Pixel today! I don’t know about you but I am dreaming of warm days! Yes, for me spring fever has officially set in! I love winter but now I am done with it. Maybe it is the three toddlers that spend their days at my house (one is my own) but I am ready to get outside! Ready to see the grass turn green. Ready to feel the warmth of the sun on my skin! And now thanks to this kit I will be all ready to scrap those great pictures I am going to take once we get out there! Today in the $2 pixel bin at Gotta Pixel you will find “Warm Days”. Grab this great deal on a great kit while you can!! Have a fabulous week everyone! Hello Bella Gypsy Fans! Happy Monday to you! I am not sure about you, but I am so loving the “spring forward” time change. The extra light at the end of the day is makes me feel as though I have more time to get “stuff” done. I know this is a highly debated topic. Some dislike daylight savings and others love it. If I had my wish, we would rid of it altogether and keep the clocks “sprung forward!” Now, if you’re one that dislikes it, I most definitely do not wish to offend, I promise. There are pros and cons for both. I don’t like that it’s dark for a longer period of time in the morning. And I suppose that would be the downside of not moving our clocks back in the Fall/Wintertime. It would probably be dark until 7:30 a.m. (or even later) which isn’t safe for the kids going to school. Anyway, enough of my Daylight Savings chit chat…I have a wonderfully warm and gorgeous peek for you today. Joy Happens at the GGI Event! Good Morning Bella Gypsy fans! Kiana back to bring you the awesome kit created by Bella Gypsy for the Gotta Grab It event at Gotta Pixel! I love the rich colors of this color palette! 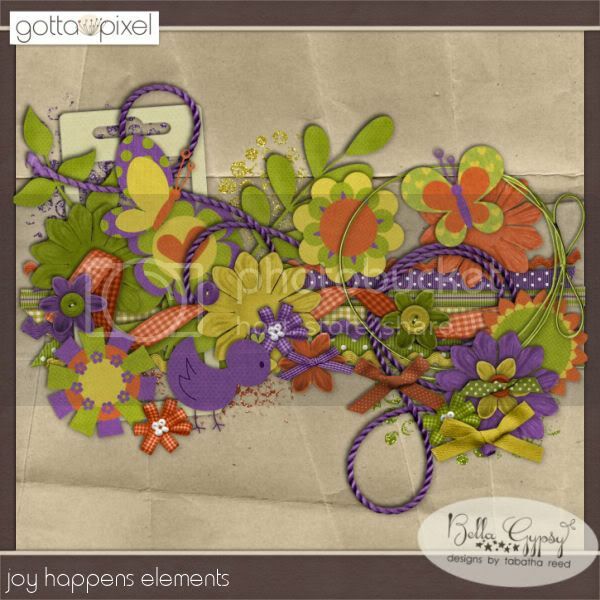 The kit that Bella Gypsy created for GGI is called “Joy Happens”. What a great name for this cheerful kit! Here is what all three pieces of this kit look like all together! You can purchase each part of this kit (elements, papers, and alpha) for $1 each during the GGI event! I just love Gotta Grab It weekends! What a great way to kick off the weekend! Things are looking good here….an awesome kit, the sun is shining! I hope you have a great weekend also! Good Morning Bella Gypsy fans! Kiana bringing you some very lucky deals on this rainy March day. 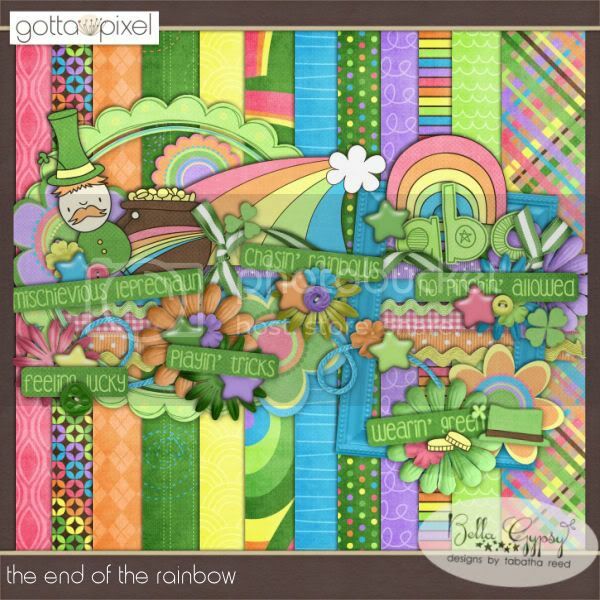 Bella Gypsy has an adorable new kit out just in time for St. Patrick’s Day called “The End Of The Rainbow”. And the lucky part for you is that today you can find this kit in the $2 pixel bin! You can also find this cute coordinating alpha set in the $1 pixel bin! And last but not least is a new Sketchology set called “Void Where Prohibited”. You can also find this in the $1 pixel bin. Here are some amazing layouts our creative cooked up using this kit! These layout are so gorgeous! If you are falling in love with this kit then today is your lucky day! Hurry over and grab these great deals at Gotta Pixel! HAPPY FRIDAY! I don’t know about you but today is going to be a great day…I will make sure of that! The sun may not be shining and it is raining in the Windy City but I have a lot to smile about today. You will have a lot to smile about too when you see the new Bella Gypsy goodies that are hitting the store today. Grins and Giggles hit the store today at Gotta Pixel and ACOT. You saw a peek yesterday, now it’s time for the full reveal today! It’s fun, adorable and perfect for all those grins and giggles!! Don’t need the full kit? You can also buy the elements and papers separately! Want a jumpstart on your page? Try these stacked papers! There are also some new templates that you will want to check out today! I will close today with a little freebie just for you! Click HERE or on the preview for your download link! Hello Bella Gypsy Fans! I hope you’re all having a fantastic week! As usual, Bella Gypsy has been working hard to bring you the absolute best and I cannot wait for you to see what’s in store for you this week! For now, I will leave you with a little peek and I am certain you’ll want to drop by tomorrow to see the full unveiling of this release. Bella Gypsy has created some must-have products that coordinate with this super-splendid kit! These colors are so fun! The bright and beautiful colors reminded me that Spring is just around the corner! I cannot wait to pull out all my tank tops, shorts and flip flops! Don’t get me wrong, I do love Winter; however, after the Holiday’s are well behind us, I am totally ready for warm weather and sunshine – something I never get tired of! Don’t forget to drop by tomorrow so you can see the full reveal and a few extras that Bella Gypsy will have in store for you! Thanks for dropping by! Hi everyone! It’s Kim here today filling in for Kiana. I can’t believe it’s the first of March. This year is going by so quickly…at least for me. I have some yummy goodness coming your way today. 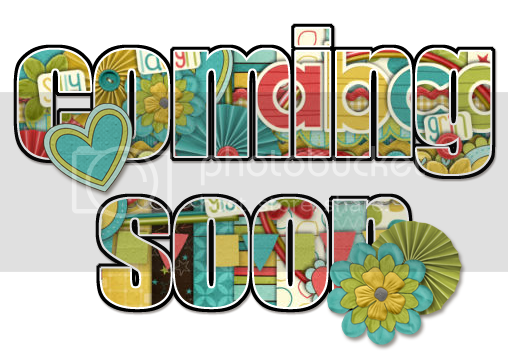 There is a lot hitting the Bella Gypsy stores so brace yourself…. Do you have a kid that loves peanut butter? Have a nutty one in the family? Or maybe a “little peanut”? We have all of those in our family! 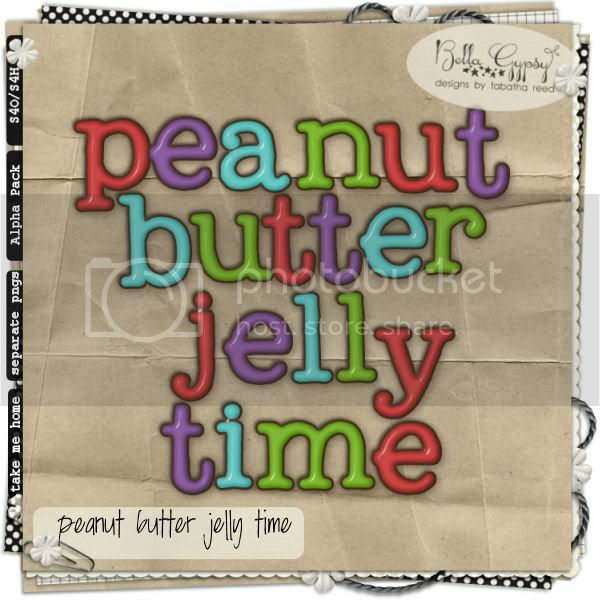 Check out Peanut Butter Jelly Time. It’s full of doodly yummies! Check out these coordinating alphas…available for only $1! We are going to change moods now…and bring you Blue Skies Fade to Gray. Be sure to check out these amazing new goodies at Gotta Pixel this week! Kiana will be back next Tuesday and I will be back later this week to show you some more scrumptious new goodies hitting the stores!